What motivates our feeling of shame, with its impulse to “cover” ourselves? Why do we feel such an impulse? What is it we want to hide? I would say that there are two major grounds for wanting to cover or hide ourselves. The two are vastly different in nature and origin. One reason we sometimes feel shame and want to cover ourselves up is modesty. In that case, what our shame urges us to avoid by covering ourselves up is calling attention to ourselves as somehow being "special." Another, very different reason we feel shame and try to hide ourselves is because we experience guilt for something we have done. In that second case, what we want to avoid, to hide from, by covering ourselves up is accepting responsibility for our actions. To feel the first sort of shame is a virtue, a strength of character. To feel the second sort of shame is a vice, a weakness of character. Joe McCarthy was the junior Senator from Wisconsin at the time. He earned the derisive nickname “Tail-Gunner Joe" because he was fond of boasting, altogether falsely, that he had been a tail gunner on U.S. bombers during World War II. McCarthy was a shameless self-promoter who did not care whether what he said of himself or others was true or not, or whether in saying it he risked hurting anyone else. All he cared about was that saying whatever he said singled him out as deserving of special attention. Joseph Welch was the lead attorney for the United States Army during the Congressional hearings called to investigate conflicting charges between the Army, on one side, and Sen. McCarthy and his attorney Roy Cohn, on the other. The way McCarthy was acting in a session of those hearings on June 9, 1954, triggered Welch’s indignation, prompting him to make the famous remark above. Welch could just as well have asked McCarthy if the Junior Senator from Wisconsin had by now lost all sense of shame. Chief Senate Counsel representing the United States Army and partner at Hale and Dorr, Joseph Welch (left), with United States Senator Joe McCarthy of Wisconsin (right), at the Senate Subcommittee on Investigations, McCarthy-Army hearings, June 9, 1954. Just as the presence of a sense of shame may express two very different aspects of character, so does the absence of a sense of shame express two very different aspects of character. The first sort of absence has to do with "shame" as the impulse to avoid calling attention to oneself. To be without any sense of shame in that first sense is to be shame-less, as we say. The second sort of absence of shame has to do with "shame" as the impulse to avoid responsibility. To be without a sense of shame in that second sense is, as we say, shame-ful. A shameless person is a person who lacks modesty. Such a person tries to draw attention to himself or herself. Such a shameless person tries to puff himself or herself up in the eyes of others, as well as in his or her own eyes. Such shameless people like to brag, boasting of their accomplishments to show how special they are, and how superior to anyone who cannot—or at any rate does not—so boast. Such shameless people are braggarts and showboats. They make the very worst sorts of friends, colleagues, or even just acquaintances. Grandstanding and self-promotion: one ought to be ashamed of oneself for behaving in such ways. To be shameless is shameful. What makes each and every one of us so special is that none of us is anybody special. Each and every one of us is unique, which means "one of a kind." In contrast, there are always a multitude of each of the many kinds of "special people," from politicians to media celebrities to intellectuals and authors. None of those special people is one of a kind in their "specialness." It is only as nobody special that each is unique, even in and despite his or her shameless self-aggrandizement. 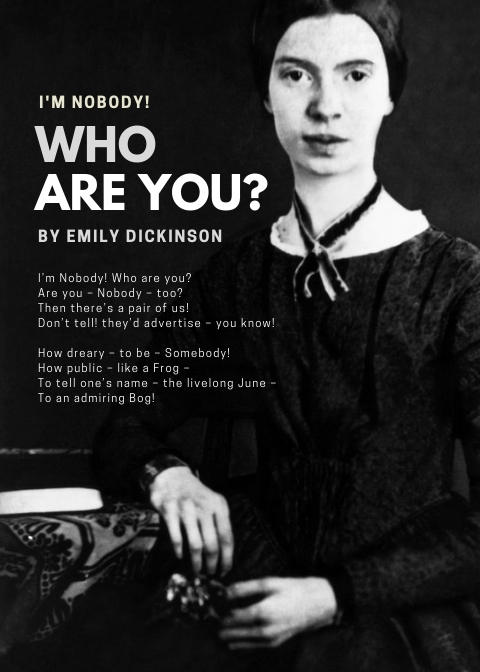 It is the liberating spirit of universal human equality that blows through the words of Emily Dickenson's modest little poem, the one with which I began this post. That is the spirit of modesty as such. To be modest is to be without pretension. Etymologists tell us that, beginning in the 1530s, the word was used to mean "free from exaggeration, self-controlled." In Latin, modestia means "moderation, sense of honor, correctness of conduct," from the Latin adjective modestus, "moderate, keeping due measure, sober, gentle, temperate," itself from the original noun modestus, "measure, manner." Our words modest and modesty, in common with all those Latin terms, ultimately derive from the Presumed Indo-European root *med-, "to take appropriate measures." For each and every one of us to take appropriate measure of ourselves is for each and every one of us is to affirm ourselves as no one special, nobody who stands out from anyone else. What is appropriate to all of us is to affirm that none of us is anybody special. Modesty becomes all of us, regardless of whatever special identities we think we may boast about having. Such boasting does not become us. It does not become any of us, without exception, no matter who we think we are.